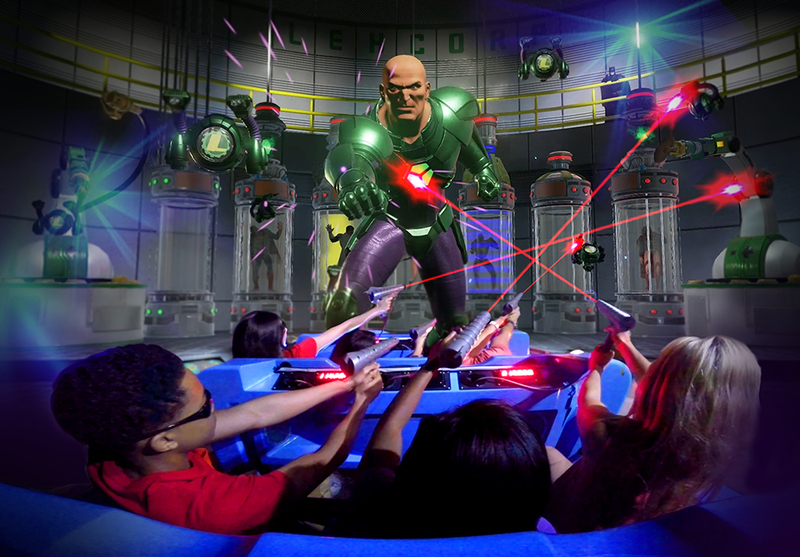 Lex Luthor, The Joker, and their henchmen have taken over Metropolis and the team of Sally Corporation, Digital Projection, Severtson Film Screens and BCI Integrated Solutions have come to save the day in this new 4D Dark Ride at Six Flags over Texas and Mid-America. Each of the rides consists of seven 3D projection screens by Severtson Film Screens of Arizona and seven 3D Titan series projectors by Digital Projections Inc. The screens and projectors were provided and installed by BCI Integrated Solutions out of Tampa, Florida. Riders are transported around the 4D experience in a motion-based ride car that travels along a track. At each scene, the riders take aim and shoot at objects being shown onto a 3D projection screen. At the end of the ride, everyone’s’ scores are displayed for bragging rights. On the left is a 30-foot x 17-foot 90-degree curved 3D front projection screens (there are two of these at the Texas attraction) manufactured by Severtson Film Screens. We worked closely with the design team at Sally Corporation for the placement of the screens and projectors since they are installed prior to any of the set placement for these scenes. BCI was on time and on budget with this project, partnering with industry leaders like DPI and Severtson are what helps us provide world class results for high profile projects like these. A special thank you to Sally Corporation for allowing us to be a part of this project. We look forward to the next project. All photos were provided by Sally Corporation.